Patricia Ann Hergott of Hebron, NE the daughter of Ralph and Ferne (Cruise) DeWald was born January 9, 1928 in Powell, NE. 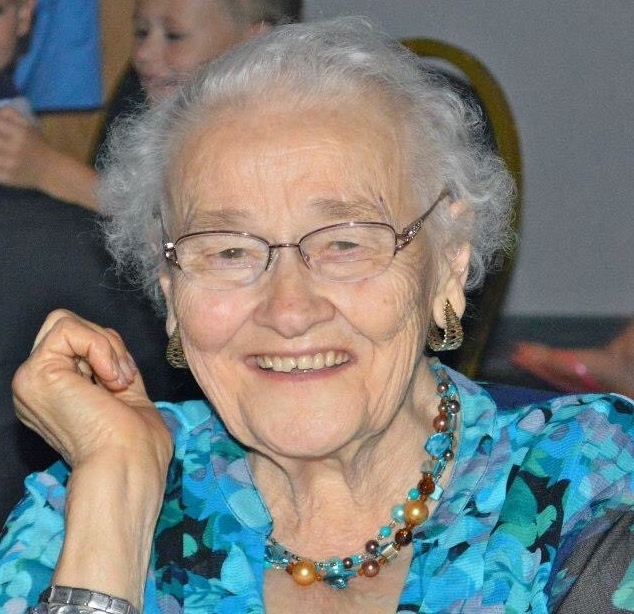 She departed this life Monday, November 12, 2018 at Blue Valley Lutheran Nursing Home in Hebron, NE at the age of 90. Pat grew up in the Alexandria area, attending school and graduating from Alexandria High School with the class of 1944. After graduation, she began teaching in a country school while attending summer school at Mount St. Scholastica in Atchison, KS so she could teach at Milligan Public School. She married Paul Hergott May 25, 1950. This union was blessed with 16 children. In the 1970’s Pat ran a daycare called Pat’s Kiddie Kampus in Gilead, NE. She also taught catechism in Alexandria for St. Mary’s Catholic Church and CCD in Hebron at Sacred Heart Catholic Church. After a fire took their home in March of 1980, the family retired from the dairy farm in Gilead and moved to Hebron. In 1981, Pat started working for Blue Valley Lutheran Nursing Home in Hebron, where she worked the night shift for 32 years as a CMA. She was a member of St. Joseph’s Catholic Church in Gilead, Sacred Heart Catholic Church in Hebron, and the Hebron American Legion Auxiliary. She was also on the board for Blue Valley Community Action. She was an avid reader, book collector, and story teller. She also enjoyed playing cards, traveling with her sisters and children, and sending out her monthly newsletter, The Hergott Gab Line, to keep in touch with children and extended family. In fact, she kept the newsletter going for many years, teaching herself how to use a computer to speed up the process, but still mailing out more than 50 copies each month in the regular mail. Pat is preceded in death by her parents, husband Paul in 2006, brothers: Ralph DeWald, Ben DeWald and wife Bonnie, Philip DeWald and wife Dixie, David DeWald, Jean DeWald, and Mark DeWald and wife Esther; sisters: Fern Votipka and husband Charles, brother-in-law Les Henkel, daughter-in-law Suzanne Hergott, son-in-law Merlin Streber, and grandson Karl Hundtofte. She is survived by sons: Bob Hergott of Hebron, Rick and wife Ila of Johnstown, CO; Herb and wife Vicki of Berthoud, CO; Mike and wife Tina of Colorado Springs, CO; Steve and wife Kay of Papillion, NE; Brian and wife Jody of Fort Collins, CO; and Jeff and wife Heidi of Lincoln, NE; daughters: Barb & husband Dan Arner of Fairbury, NE; Betty Streber of Crete, NE; Margaret Kobel of Winston-Salem, NC; Cheryl and husband Mike Dougherty of Gilead, NE; Cyndi Shinn and husband Gary of Fairbury, NE; Becky and husband Tom Hoover of Fairbury, NE; Rita and husband John Luongo of Hebron, NE; Jan and husband Dan Behn of Hickman, NE; Janelle and husband Eric Coady of Roca, NE; sisters: Doris Henkel of Tobias; Jane Cords and husband Herb of Lincoln, NE; sister-in-laws: Jeannie DeWald of Fairbury, Doris DeWald of Alexandria, 45 grandchildren, 41 great-grandchildren, nieces, nephews, and friends. Mass of the Christian Burial will be Thursday, November 15, 2018 at Sacred Heart Church in Hebron at 10AM. Rosary service will be Wednesday, November 14, 2018 at Sacred Heart Fellowship Hall at 6:30PM. Officiant will be Father Rudy Oborny, acolytes Dan Arner and Roger Retzlaff, readers Jennifer Fischer and Nathan Hoover, altar boys Keith Hergott and Christian Hergott. Organist Carlece Kenner, cantor Robin Timmermans, congregational hymns “Here I Am Lord”, “Be Not Afraid”, “It Is Well With My Soul”, soloist Anthony Pingel-“Oh Beautiful Mother”. Casket bearers: Shannon Arner, Jake Hergott, Chance Hergott, Austin Hergott, Owen Coady, Evan Hergott, Jarrod Shinn, and Joseph Dougherty, honorary casket bearers: Robert Hergott, Richard Hergott, Herbert Hergott, Michael Hergott, Steven Hergott, Brian Hergott, Jeffery Hergott. Visitation will be Wednesday, November 14, 2018 at Kroll Funeral Home in Hebron, NE 2pm-6pm. Burial will be in the Sacred Heart Catholic Cemetery. Condolences may be left at www.krollfh.com. Kroll Funeral Home of Hebron, NE is in charge of arrangements.